Yesterday, Canaccord Genuity, came out with a report on the profits taken in by the mobile phone sector and Canalys came out with a report on the market share in the tabet, notebook and desktop sectors – and all anyone could talk about was whether Apple and Samsung could take in more than 100% of a sectors’ profits or whether the tablet was truly a PC or not. Please. These are accounting and verbal semantics that are as meaningless as asking how many angels can stand on the head of a pin. Let’s focus on the implications of these reports and ignore the bickering over irrelevant rhetorical flourishes. According to Canaccord Genuity, Apple took in 69% of the handset (all mobile phones, not just smartphones) profits in 2012. Samsung took in 34%, HTC accounted for 1%, BlackBerry and LG broke even, Motorola and Sony Ericsson both acounted for minus 1 percent and Nokia brought up the rear with a negative 2 percent of the industry profits. No one not named Apple or Samsung is making any meaningful profits from the handset sector. Considering that both Microsoft and Google’s Android are based on a licensing model, this is more than a little shocking. Licensing is supposed to encourage variety among hardware manufacturers. Clearly, that is not happening. 1) With 69% of the profits, iOS is doing just fine. More than fine, actually. 2) Android destroyed every phone manufacturer not named Apple (BlackBerry, Nokia, Palm, etc.). 3) Samsung destroyed every Android phone manufacturer not named Samsung (HTC, Motorola, Sony Erricson, etc.). Pundits like to predict the imminent demise of iOS, but those profit numbers say just the opposite. And even as Android’s market share has increased, iOS’s profit share has increased too. Market share is no guarantor of profits. This should be self-evident. But apparently, it’s not. The big losers here are Palm, Nokia, BlackBerry and Microsoft. Palm is gone and Nokia and Blackberry’s market shares and profits have fallen off a cliff. And Microsoft? After three years of flailing, Microsoft’s Windows 7 is dead and Windows 8 phone manufacturers are all in the red. There are two things that we can take from this statement. First, personal computing sales are growing at a respectable rate, however all of that growth is coming from tablets, not from notebooks and desktops. Second, tablets now make up one-third of the mix of tablets, notebooks and desktops. In fact, several groups are now predicting that tablets will outsell notebooks and desktops by the end of 2013. This is a monumental shift in form factors and not everyone is making the changes necessary to stay abreast. Who Is Selling All Of The Tablets? According to Canalys, Apple – despite being supply constrained – sold 22.9 million tablets for 49% share, Samsung shipped 7.6 million tablets, Amazon shipped 4.6 million tablets for 18% share, and Google’s Nexus 7 and 10, combined, shipped 2.6 million tablets. Again, companies like HP, Lenovo and Dell are almost non-existant in the 10 inch tablet space and Windows 8 tablets aren’t even competing in the rapidly growing 7 inch tablet space. As an aside, Canalys seemed impressed with the Google Nexus numbers but I’m not. If you’re selling your hardware at cost and making it up in content and advertising sales, then your sales numbers should be much, much higher. And it has to be an embarrassment to Google that the Amazon tablets – which have the same business model as Google – are far outselling Google’s tablets. Who Will Be Selling The Tablets Of Tomorrow? Samsung made impressive growth in tablets this year, but their tablet future seems uncertain. With Amazon, Google and Apple all able to supplement their tablet incomes with App and content sales, Samsung is left out in the cold. It’s still early days for Windows 8 tablets, but it’s not looking good. I expected there to be an explosion of Windows 8 tablet sales last quarter due to pent up demand and holiday buying. The question in my mind was whether Microsoft would be able to sustain its large initial sales momentum. That initial sales explosion didn’t happen. Windows 8 tablet sales were more than disappointing. An ill omen if ever there was one. And as I’ve stated before, regardless of how well the Surface Pro sells, it is a notebook, not a tablet, competitor. In a world where tablets are clearly the next big thing, Microsoft is still insisting that what people really want are hybrids, not pure tablets. 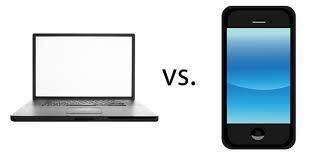 Smartphones and tablets are growing and notebooks and desktops are stagnant or declining. Only Samsung and Apple are competing in phones. Only Amazon, Google, Samsung and Apple are effectively competing in tablets. The mobile “train” has left the station and companies like HP, Lenovo, Dell and Microsoft are standing on the Windows 8 platform, watching it pull away.